Studio LuS becomes Gallery LuS. Original gallery only in use as window display from this moment on. Lectures on composition in photography for three classes of high school students in Kampen. My photograph Concentric becomes my 75th to reach Flickr Explore, the 500 best photographs of the day. Opening of Studio LuS, an extension of Gallery LuS. Publication in regional newspaper. First publication of a photograph of mine in a magazine (Poort20). First sale of a print of one of my photographs. The new web site www.galerielus.com gets extended with an overview of my photographic work. Opening of Gallery LuS in Kampen (NL), several publications in local and regional newspapers. 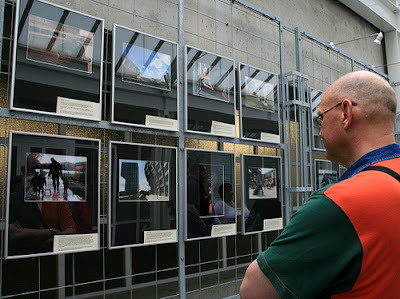 Permanent exhibition of a small selection of my photographs. A Singapore company purchases the non-exclusive right to use the image Shanghai Patterns in a brochure - first sale. The web site Advanced Photography posts a special on Abstract Photographs. Of the thirty-five images used to illustrate the theme, five are by me. The shot Paris Patterns becomes my fiftieth photograph to reach Flickr Explore, the 500 best photographs of the day. The New York Skyscraper Museum uses Aurora in their exhibition on Shanghai. The shot Windmill in ice reaches #22 in Flickr Explore, so far the highest position for one of my shots in that compilation of 500 best photographs of the day. The photograph All in the family is one of twenty selected entries for the exhibition Relaxed in Almere shown in the City Hall for a month. Fist public showing of my photography. The first time that a shot by me gets selected for Flickr Explore, the 500 best photographs of the day: Smooth Jazz, a portrait of the family dog. The photograph Commuting in the fog, a snapshot at the station in the morning, is the first one to draw considerable attention on Flickr. To date it is still one of the most-faved shots in my stream. Opening of Flickr account - first sharing of my pictures on-line. For a short overview of some other sites using my photographs, click here please.